A little about your self `ie your education Family life etc. 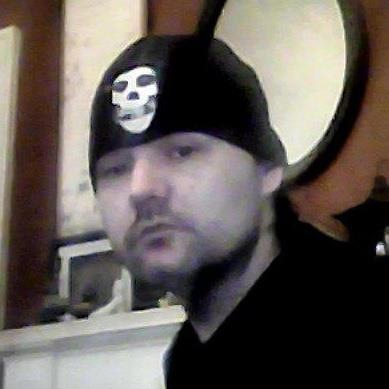 I live with my wife and two kids, Daemon & Rayven. Daemon is 11 & Rayray is 13 going on 31! I know that I was still young enough that I was still taking bubble baths. I would smudge bubbles in my hands and pretended that they people who had been trapped in an ever closing room until their brains exploded! … in hindsight I could’ve probably used some therapy lol…That night I wrote my first short story about a haunted house and a room that shut in like a trash compactor. I can’t remember ever wanting anything else. In grade school I remember my teacher would let me write & turn in a full story place in place of a book report! I have always considered myself a writer but I guess I really considered myself a writer when I actually finished my first story, “A Long Night”… the one about the haunted house, a demon possession story. Like I said I was always writing but I guess the defining moment would be when I watched Friday the 13th Four, The final chapter. Before the advent of fanfiction.com was so upset that Jason was dead I wrote a Friday the 13th part five! I finished my story and was possessed with going to Hollywood! I couldn’t even drive! (If I would’ve been patient they would have brought Jason back anyway lol hindsight is 2020. The title is an ode to Danzig &when you read my book it is kind of self-explanatory. I don’t know if I would change anything, tell me after book 3 is published, but the concept went from short story years ago morphing into a trilogy so Wolves’ Blood is close to my heart. I wanted to transform so badly into a wolf… So I studied all I could about Lycanthropy. I learned several myths and even incantations to become a werewolf. 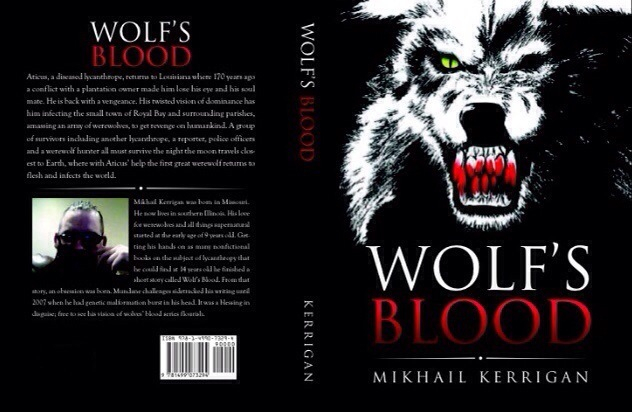 I began to write a short story called “Wolf’s Blood”. I tried to combine features of The lunatic Peter Stumpp (whose known as Peter Stube, Pe(e)ter Stubbe, Peter Stübbe or Peter Stumpf), he was a werewolf just in his mind to the the beast of Gévaudan & Jean Chastel where The legend of the silver bullet all got started (though in many myths The werewolf is equated with The vampire and silver was a sure fire way to dispatch him) & many, many others. I had to come up with a way to become a werewolf when you weren’t born one. 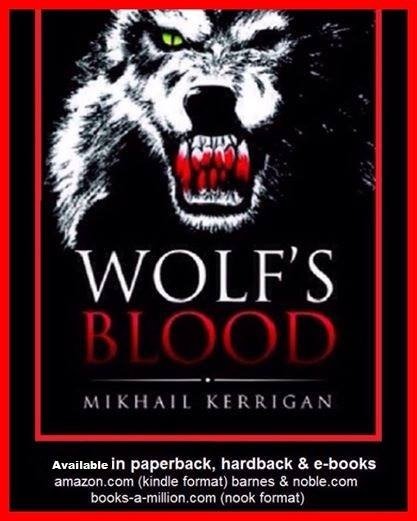 As far as those who say Lycanthrope can’t do that “in real life” all the information is through myth, legend & the written word & my novel is “written word” It is in this case, it is true. For all those doubters I so love and respect the Lycanthrope legend and I tried to include all things that I love the most. Read the Trilogy and you will see I tried to do the myths justice. None of it when it comes to the characters but some “facts” are straight out of myths. It is of course a work fiction and the characters cores are made up all in my head. There is of course things partially nonfiction when he comes to the mysteries of the subconscious. A Rudimentary survival instinct flight or fight… As a former Alcoholic I would get plastered till I was on all fours running around the Street and when around on all fours until I tried out and took to hiding… I would see all these Ridiculous things I would not have any control over it. One time I got so drunk only animal instinct remained. My wife says that she can see how many of the characters are based off different facets of my own personality. Brian Rogers, a friend of mine who introduced me to the Dragon program. Yes&no. While writing is a passion of mine and it cannot be quenched I have a family and I had to food on the table. In grade school when I was just a kid I told my grandmother that I would be a writer even if meant scrubbing toilets for a living. Then a genetic malformation in my head burst, I had a brain bleed… others might call it a curse but I felt blessed. I think It is too soon to ask me if there is any changes to be made. Maybe ask me after book 3 is published. Do you recall how your interest in writing originated? Like I said I always wanted to Can you share a little of your current work with us? Fact checking because although it is an entire work of fiction I wanted the Reader to be caught up in the world of the lycanthrope and in their minds says “this makes sense, this could happen…” you are never too for wonderment. I want them to retain a sense of wonder. I want them to open themselves to the possibility of things that go bump in the night and let their imaginations run free with possibilities and what ifs. Despite what others might think don’t ever throw away any of your work…and most of all do not wait to publish. Do not worry about other authors and if they have similar works to you. And I finished the book but my mother was skeptical. She thought I had just seen the movie till I told her pages that weren’t in the movie. When Perseus had to swim the river Styx he had gotten trapped, entangled and it threatened to Drag him under. He was afraid that medusa had come back for him to reclaim her head! Turned out it was just driftwood! sushi & Chinese food & Imo’s the square beyond compare! Black and various shades of black. musical taste varies with my mood. When I am writing I listen to The soundtrack to whatever music I think fits the scene. My life as a soundtrack would consist of The Doors, Alice Cooper, Ozzy Osborne, the misfits (pre-Danzig and post), Danzig himself, The Rollins band, Marilyn Manson whatever gets my blood pumping and heart racing. Loved your advice for other authors. I happen to be an aspiring one, myself, and have finally happened to luck upon a publishing agent who is now reviewing my first full length story, as well as my collection of poetry (dark and otherwise). You, sir, are an inspiration.